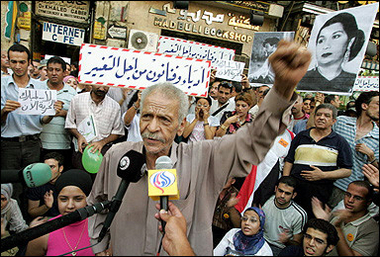 Ahmad Fuad Nigm at a Writers and Artists For Change rally in Cairo last week. I love Ahmad Fuad Nigm. I’ve loved him ever since, as a young girl in high school at El-Nasr Girls’ College in Alexandria, I found a copy of his collection, el-murgeha, on my socialist ex-general grandpa’s bookshelf.